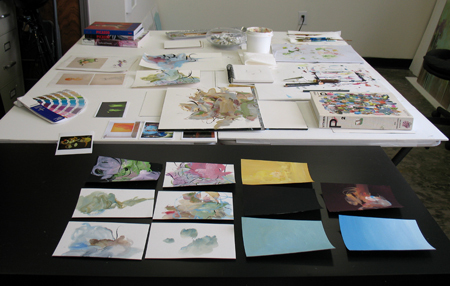 I visited Ryan’s airy studio near Atlantic Station at the end of July. His spends all day painting, arriving around nine in the morning and leaving at five-ish. After spending over eight years as an assistant to Jeff Koons, I’m not surprised at his discipline. Even more impressive, the day I made the appointment to visit was his birthday. We chatted while I took photos of his studio and work, and he sent me his own photos to round out the interview. I coveted a few of his prized books – one on Cy Twombly and a present from his wife, Vitamin P2, a book of new contemporary painting published by Phaidon. Coleman grew up with creative parents; his dad Steve Coleman worked for Disney in LA and his mother has worked in interior design. 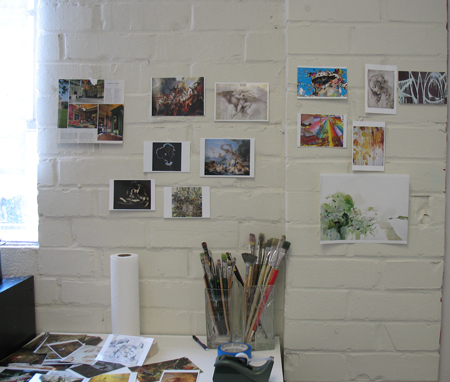 In his statement Coleman notes that a diverse set of elements informs his work; cartoons, historical references to art, graffiti – and many of these are evident in the postcards and clippings tacked to a wall in the studio. 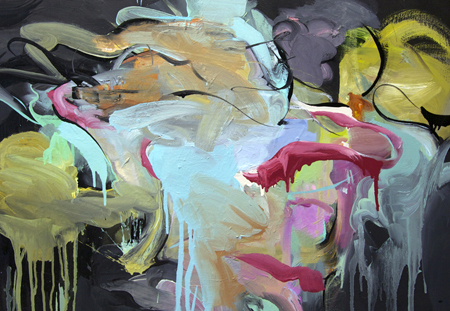 After eight years in Brooklyn, Coleman moved back with his wife to Atlanta in 2011 and has been showing at various galleries around the city. He shows at Pryor Fine Art and was recently in a group exhibit at Poem88. The following interview is compiled from questions written before the visit, my notes during our meeting and from Ryan’s thoughtful written responses. VW What led you to become a painter? RC I’ve always been creative as long as I can remember, and it was encouraged from both sides of my family. My mom was an interior designer, and my dad a cartoonist (both are semi-retired). Though separated when I was young, I was exposed and greatly influenced by both of their creativity. My mom always encouraged being creative because she was so much herself, finding unique ways to decorate our home, and working on projects constantly. My dad inked a comic strip when I was young, and I would watch him work, and was fascinated by the sharp, crisp line he would make with a brush and ink. He was also extremely passionate about animation and had tons of animation books lying around. So art was always there, but it wasn’t really until high school where I knew I wanted to be a painter from then on out. VW Can you describe how NY or Atlanta has influenced your work? Talk a little about working in Brooklyn and your time as an assistant to Jeff Koons. 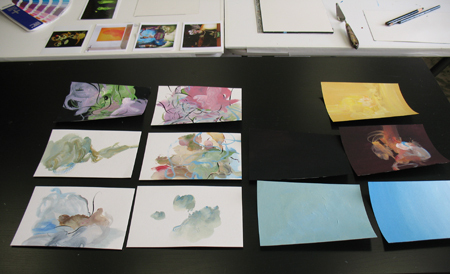 Your work is so different in that you’re an actual painter and not doing conceptual work. RC I grew up in Jacksonville, Florida where I attended Douglas Anderson School of the Arts, a magnet school. In 1996 I was accepted into the Atlanta College of Art, and coming to Atlanta from Jacksonville was extremely exciting for me at the time. There was a great arts scene going on. 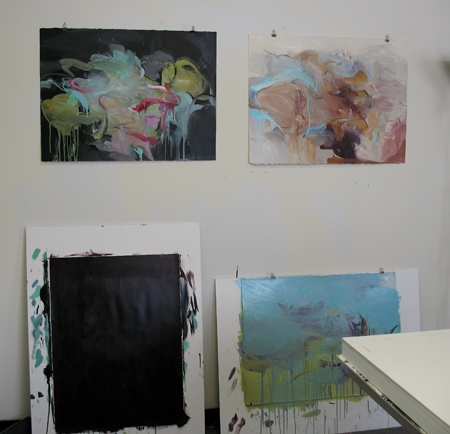 Atlanta for me was really a jumping point, and an introduction to the greater art world. My junior year at ACA, I was accepted into a studio program called the New York Residency Program, and went to live in NYC for a semester in 1999. This changed and matured me in so many ways, and I knew immediately that I needed/wanted to move to New York City. You hear it all the time, but there really is nowhere else in the world like it, especially for art. The museums, the galleries, the city itself, is massive and bursting with energy. It affects you big time. I came back to Atlanta, finished up my BFA, freelanced briefly doing animation for Cartoon Network and had my mind set on moving to New York. The opportunity came shortly after my good friend, Todd Wahnish, asked if I wanted to move with him, and I excitedly took it (this was 2003). For the next 8 1/2 years, I immersed myself in the city; going to shows, making art, and working full time as an assistant to Jeff Koons. This was one of those life changing experiences – working with a wonderful and talented group of people, and being part of something so large and exciting. Seeing and experiencing how an artist on that scale operates was amazing. It entailed a lot of problem solving and working as a collective to execute Jeff’s vision. You’re mostly focusing on the production of the material and paying extreme attention to detail, with 100 or so other people with similar interests. The drawback of working full-time anywhere is the amount of time you sacrifice on your own work, and between that and going out, it leaves a small window of time to produce your own work. In early 2011, my wife and I decided to move back to Atlanta to take a bit of a break from the city and focus on our own thing. Fortunately, I’ve been able to devote most of my schedule to my own work, and I’m excited to participate in the art scene here. That was a very long answer to a short question… Both have had positive influences on me and my art, in different ways. 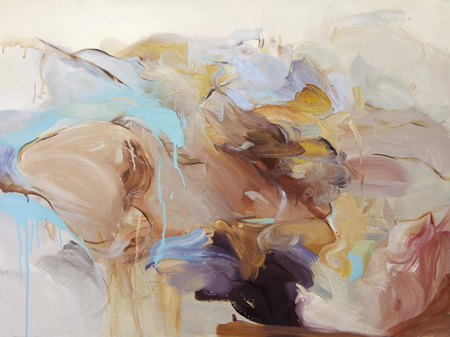 on the right – Untitled (Jungle), oil on canvas 40×48″, 2012. VW Describe your daily painting/working routine and what inspires your paintings? Do you make sketches or draw on a regular basis? RC To sum up the things that inspire me in painting are: art history, evoking a mood or emotion in the work, and elements of cartoons and graffiti art. I’m equally fascinated with the illusion of depth and narrative you’ll find in pre-Modernist painting, the immediacy and impact you find in Abstract Expressionism, and the color and pop of animation and street art. 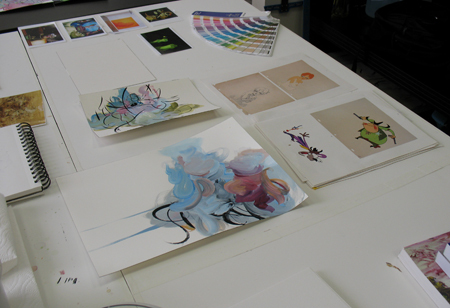 My overall mission as a painter has been to portray a little of each in my work. I’m also inspired by the sublime and optimism. I do make sketches and draw on a regular basis. 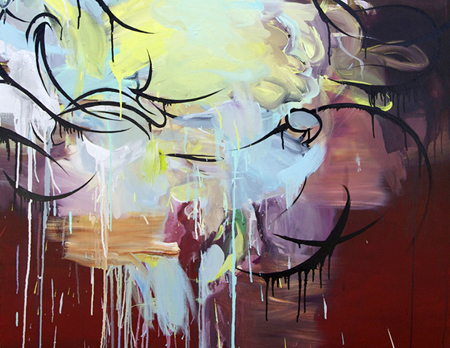 Detail from Untitled, oil on canvas 40×48″, 2012. VW I see a little Pat Steir in some of the larger pieces and a sort of Japanese calligraphy in the smaller works on paper. 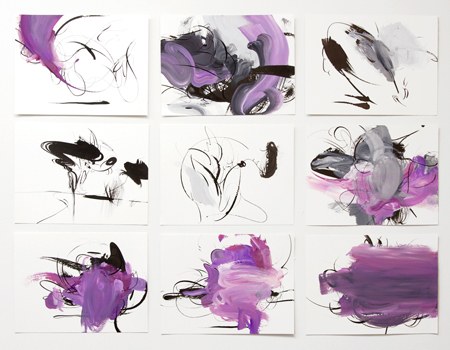 The dynamic and motion in the work almost reminds me of cell animation, an abstraction of movement. 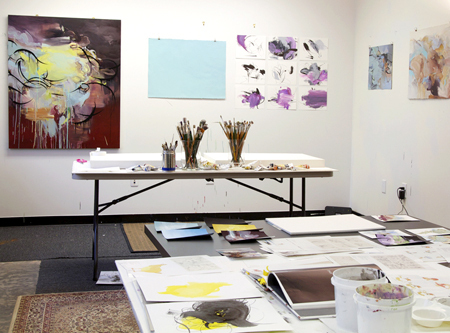 Can you talk about the context of your work and any ideologies you may have as an artist? RC I think the context is trying to incorporate an acknowledgement of where painting has been, where it has come from, and where it is now. I tend to lean toward abstraction and obscuring the subject matter or imagery into something which contains a shroud of mystery. I’m drawn to work that has a bit of this mystery in it, and one artist in particular who comes to mind in regard to this is J.M.W. Turner. I saw an exhibition of his a few years ago at the Metropolitan Museum in New York, and was deeply moved by his paintings. I was also struck by the size and commanding presence they emit, and that they teeter between abstraction and representation. VW Which artists have had the most influence on your work? 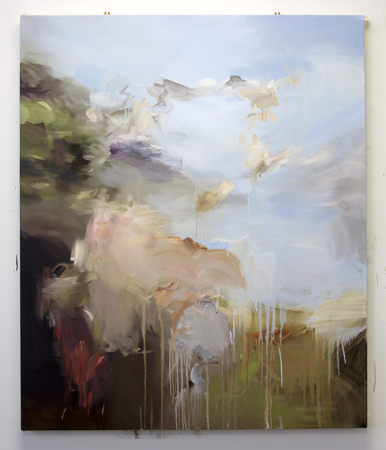 And are there current painters whose work excites you? RC Very much so… I’ll try and keep this short (the list is long): Leonardo da Vinci, Peter Paul Reubens, Corot, Monet, Picasso, John Singer Sargent, Cy Twombly, Robert Rauschenberg, Jean-Michel Basquiat, James Turrell, Vernon Grant, Cecily Brown, Inka Essenhigh, Takashi Murakami, Os Gemeos, Kristine Moran. VW Some artists suggest that the studio is too private for them, that they require a social forum for their work. Does networking with other artists and developing community have much bearing on your life as an artist and if so, how does it inform your work and process? 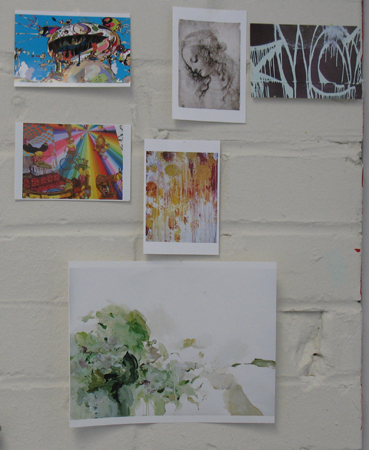 RC I enjoy both the privacy of working in my own studio, and networking and socializing with other artists. For me it goes hand in hand. 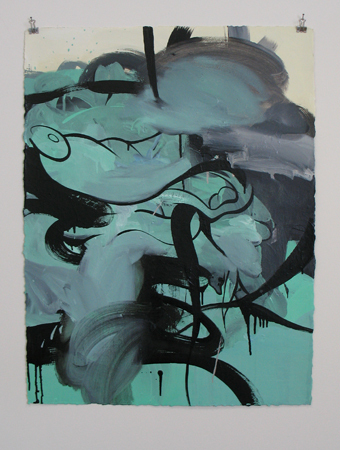 Phoenix, oil on paper 22×30″, 2012. VW I’m always curious about how painters are utilizing social networking. I know painters who have been successful marketing their work online, even while they’re represented by a gallery. 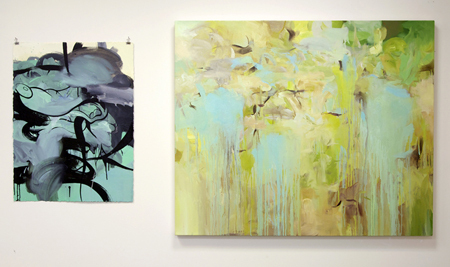 Have you explored some of these or other alternative ways to either exhibit or sell your work? RC Yes. It’s amazing how these days you can share your work with someone half way around the world in real time. I’ve done commissions and sold work both domestically and internationally – all through online communication. It’s a real thrill to get an e-mail from someone that you’ve never met who’s interested or moved by your work. VW This next question may dovetail with the previous one; are you able to make a living solely from your painting, or do you work a ‘day’ job? RC I have several avenues I utilize to make a living with my work, with some being more glamorous than others. 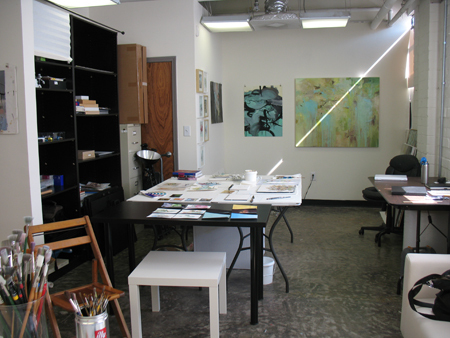 I feel extremely fortunate though, to be able to work in my studio full-time. Of course, the best is when a work sells for what it is, it’s really an amazing feeling. I’ve done portraits, unique commissions/installations, and am about to begin work on two very large graffiti-styled backdrops for a private event. I’ve also been developing an online shop for my more illustrative/cartoony work, which I hope to launch soon. VW Any immediate plans for exhibits and/or the next series of work? RC I just participated in group shows at Poem88 & Pryor, and an event at Site95 in Brooklyn, NY. 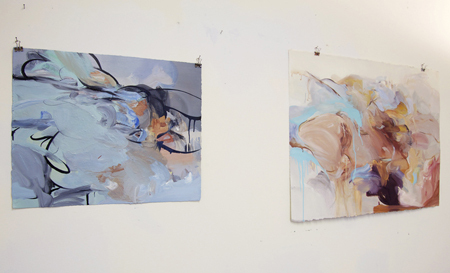 I’m currently working on a new body of work which I’ll be posting on my website and blog soon. I’m looking to expand showing opportunities locally and beyond! You can view Ryan Coleman’s work online at his website, follow him on Twitter and Tumblr. 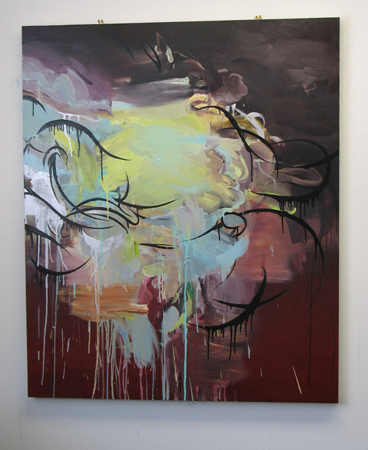 This entry was posted in Daily meanderings, Interviews and tagged abstract expressionism, art, calligraphy, cartoons, graffiti, jeff koons, painting, renaissance, representation, Ryan Coleman. Bookmark the permalink.